Last year, my sister, her husband, Bob, and I started talking about how fun it would be to have a Dickens Dinner around Christmas time. At first, we joked about having a goose and eating only by candlelight, but soon we decided that our Dickens-inspired dinner would include only elements from the classic "A Christmas Carol". As it turns out, goose is quite expensive, so we went with a turkey. My brother-in-law made wassail, and I made a New England Sausage and Cranberry Stuffing, which I will share as soon as I can get a photo. 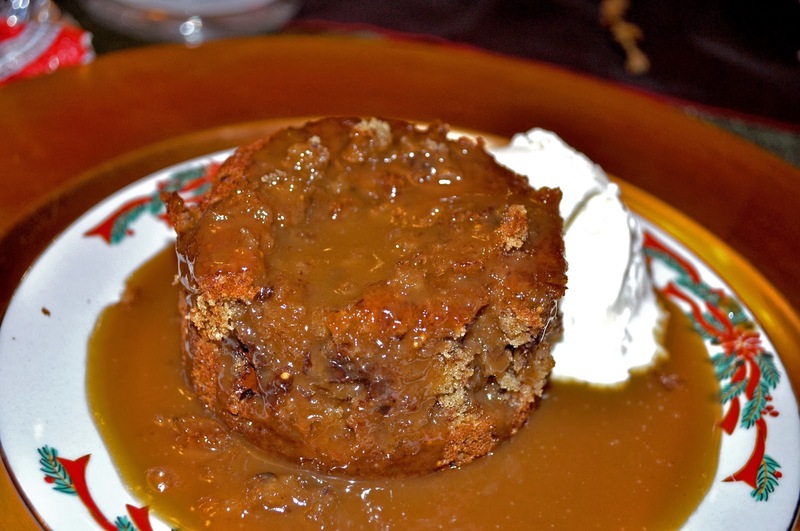 One thing we knew from the start, the English holiday dessert figgy pudding was a must! While I don't know how traditional this figgy pudding is, it had great reviews on Food Network (and was featured on Ultimate Recipe Showdown) so I went with it. I have to say, it was one of the best desserts I've ever had! We all agreed that it was a hit and must return to our annual Dickens Dinner. We served ours with vanilla ice cream. The combination of the warm cake and caramel sauce with the cold ice cream made this dessert even better. I was only able to snap some poor shots last year because it was night time and I was wrangling a 1-year old. I hope to get some better photos this year and will add them later, but I didn't want to sit on this recipe any longer - it's too good not to share! 2. Using a hand mixer, cream the butter and sugar in a large bowl. Add the eggs and beat well. Fold in the flour, the pureed date mixture, and the chocolate. 5. To prepare the sauce, stir the sugar and cream in a medium saucepan over low heat. Simmer until the sugar dissolves. Raise the heat to a boil, then reduce and simmer 5 minutes. Add the butter and stir until incorporated. (I made this at home and took it to my sister's. Then I reheated the sauce prior to spooning it over the cakes). 7. Serve warm topped with ice cream or whipped cream and enjoy!